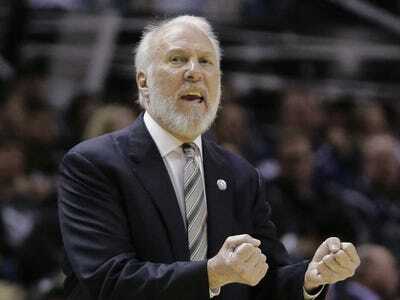 Eric Gay/APGregg Popovich says winning shouldn’t define a person. “In today’s world, if you don’t win the whole thing, whether it’s football or basketball, or this and that, people have a tendency to paint you as a loser or act like you just robbed the cookie jar. Well that’s baloney. When the Spurs lost in 2013, Popovich said he was quick to keep his team from blaming bad luck, telling them, “You’re in charge of yourself. There are always things you can do better.” The team spent hours reviewing every play from Games 6 and 7 of the 2013 Finals and learning what they could have done better to have won the championship. Popovich explained how he and the Spurs often talk about entitlement and appreciating their opportunity to play in the NBA. “Because you were born to these parents or this area geographically, or this situation, you deserve more than somebody else? … That’s the most false notion one can imagine. It’s deep stuff from Popovich, who is often seen acting grouchy on the court or during interview. However, behind that character, he’s reached the peak of NBA coaching, putting games into much bigger contexts to improve his players’ outlook on life.